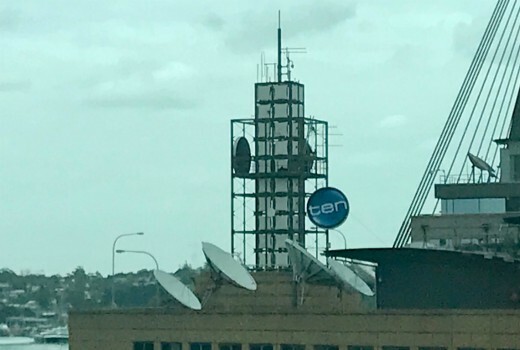 Workers yesterday removed TEN’s logo from its Pyrmont headquarters, ahead of a new look to be unveiled at its Upfronts tomorrow. TEN’s Upfronts will take place tomorrow night in Sydney, attended by Armando Núñez, President & CEO at CBS Global Distribution Group. 10 refreshed its promos by changing the fonts and the package. Their HD bug has changed and narrowed down a bit. When they have a Live telecast on primary channel, they got rid of the ‘Live & Free’ and replaced it as “Live”. In WIN Areas, they continue to have a blue watermark of Australia on the screen and it is quite distracting. It takes up 1/10th of a screen and I cannot stand it. WIN Boss and WIN Peach have got colored watermarks hanging down on the screen. For Live events, Will WIN use the map of Australia with the ‘Live’ Bug? Boss and Peach showing on the WIN EPG earlier today. Updated a bit early? Yes it leaked through YouTube last night. 10 Boss and 10 Peach are also confirmed as per rumours. The new logo isn’t as bad as those two names. That’s not saying much though. Speaking of logos, I notice TEN are no longer concealing the CBS logo on shows like ‘The Talk’. Hi. I have a strange feeling that One will be rebranded as 10Spike and not 10Boss as a lot of people think. The reason why I think this is because Channel 5 in the UK has a channel called 5Spike, and you may be wondering Channel 5 in the UK is owned by Viacom (Viacom also owns Spike BTW) and Channel 10 is owned by CBS Corporation, so why am I thinking that One will become 10Spike? Well, CBS Corporation (which owns Ten) and Viacom (which owns Channel 5 in the UK) are both owned by National Amusements, and I believe that in the US there is a lot of cross-over between Viacom and CBS. Eleven becoming “10Peach” leaves a lot to be desired though. The current Ten logo is just fine as it is. I think it looks quite nice actually. I agree, when they dropped the yellow from it it looked quite classy. I’d prefer they stuck with the current one but seems that ship is about to sail. Pls neither of these names , there awful !!! One is “TEN Boss”, while the other is “10 Peach”. The former has been accepted while the latter is still under investigation, as is “10 Daily”. “10 News First” is also pending investigation. I wonder why they didn’t apply for “10 Boss” in that case? Hopefully all will be revealed tomorrow night and neither of those two awful names are mooted for the multichannels. While that is true, it should be noted that not all trademarks are eventually used. There is a possibility that this whole “10Boss” thing may be a red herring. For example, according to the Japan Patent Office in Japan, there has been numerous trademarks for Pokemon games, such as Pocket Monsters: Topaz [application number 2002-063587, registration number 4677891], but was never used. So even though “10Boss” has been accepted as a trademark, it might not be used at all. We have to wait until later on today to find out. Could have just named the multichannels Butch and Femme. Hoping it doesn’t signal only men can be a boss. Does seem to though, doesn’t it? Just watched the promo and both genders can be boss. Judge Judy, Olivia Benson (Mariska Hargitay) and Gibbs (Mark Harmon) featured. Yet I notice the one at Ten Melbourne in South Yarra is still very outdated, the circa. 2000s one? About 15 years old! Boss and Peach? Would love to see the market research that shows viewers like those names. @ Lee-Roy, ha ha, very clever!